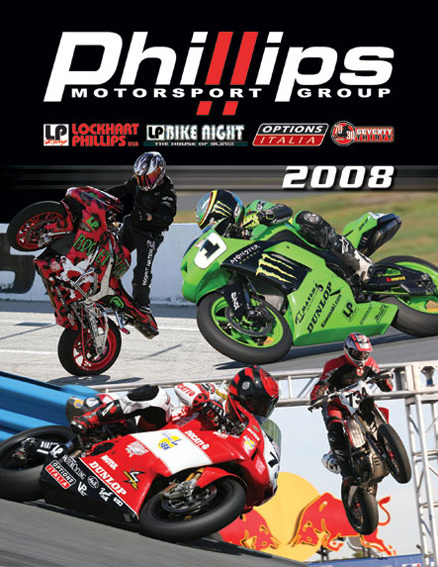 Phillips Motorsport Group, with divisions Lockhart Phillips USA, LP Bike Night, Options Italia and Seventy-Thirty Racing, introduces the 2008 catalog. With over 25 years of experience in the sport bike aftermarket, Phillips Motorsport Group offers over 10,000 selections of performance, custom chrome, billet and stunt sport bike parts and accessories available at over 4,500 dealers worldwide. The biggest change for 2008 is the "Bike Night" section of Lockhart Phillips USA becoming it's own catalog. With the stunting and custom sport bike scene becoming the fastest growing segment of the motorcycle industry, the LP Bike Night catalog showcases the unique product lineup for this exciting sport bike aftermarket segment. LP Bike Night offers the latest and best in bolt-on products to help you transform any stock sport bike into a one-of-a-kind custom creation. The Lockhart Phillips USA, Options Italia, and 73/30 catalogs have been revised and expanded to include the latest performance products and accessories as these markets continue to grow. Thanks again for your support in 2007 as we celebrated our 25th anniversary and have a great 2008 season!!! The 2008 Phillips Motorsport Group may be ordered online at www.PhillipsMotorsportGroup.com.